After finishing a couple quilts I sometimes like to end the session with something quick and small. 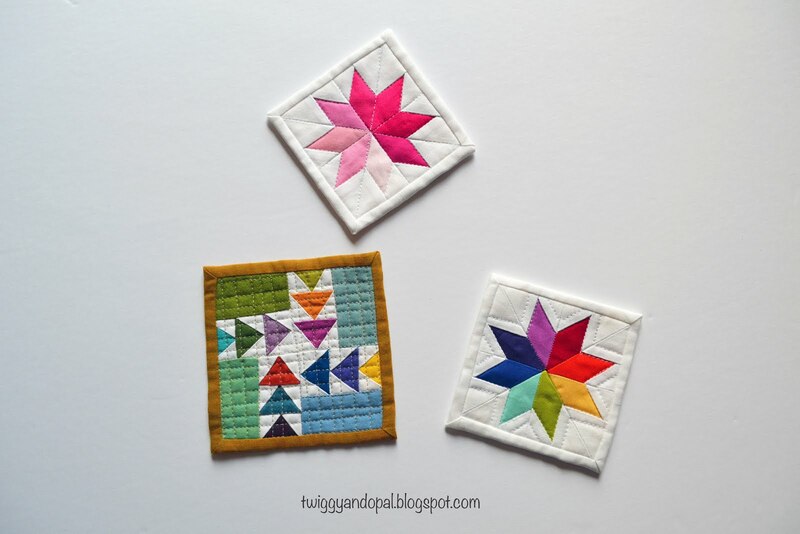 Before I start my next quilting adventure I decided a few mini mini quilts were in order! 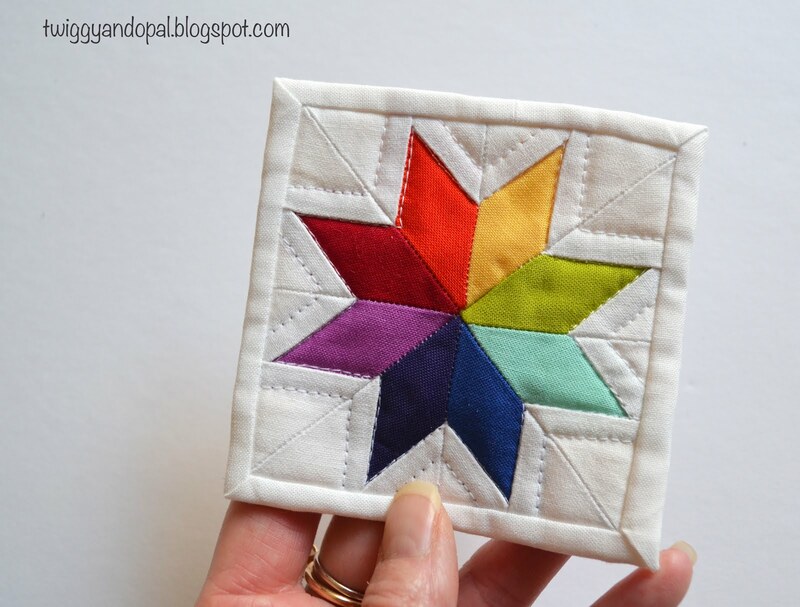 You know I love a rainbow and paper piecing, so the logical choice for me was a star. The other bonus is I get to use small scraps and templates that I printed long ago. I'd hate to see the paper and ink go to waste! It's always fun making these! There's nothing quite like a rainbow in a mini! When paper piecing normal size pieces we always try to minimize the waste of fabric, because frankly...there can be a lot of waste! With a mini mini it's the one time I really don't give a care! It's already tiny, why stress myself out worry about fabric waste?! I posted my star mini on Instagram and asked which was your favorite: Rainbow or Pink. The overwhelming consensus was the Rainbow! Not a big surprise! Which brings me to the pink star. Nothing fancy here, just some lovely pink! 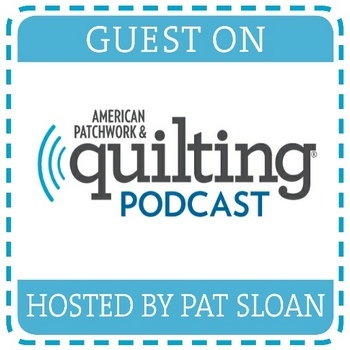 When making mini mini quilts another challenge can be quilting. I mean...they are tiny and quilting something elaborate would be difficult at best! 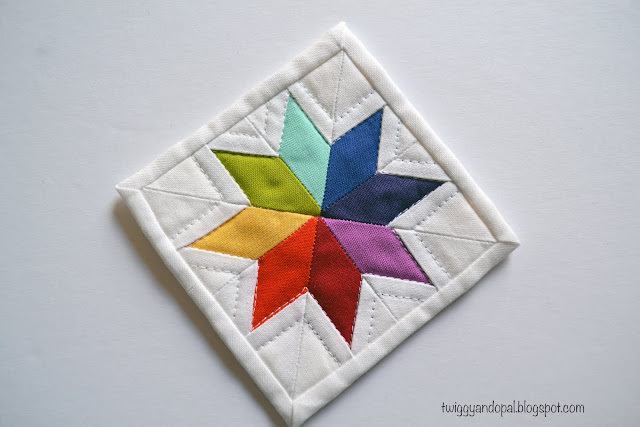 The stars received the simple quilting treatment. One more for good measure! As I was digging through my templates I came across some tiny geese. Since I was on a roll I decided to throw together one more. This time I used shot cottons, 17 different colors including the binding! I pretty much quilted the heck out of it! An organic grid worked well for this one. I like putting the pedal to the metal when organic quilting something this small! The playtime has come to an end...or has it?! I might have another trick or two to share! Mini Mini fan or not? Do you like to make them or just look at them? 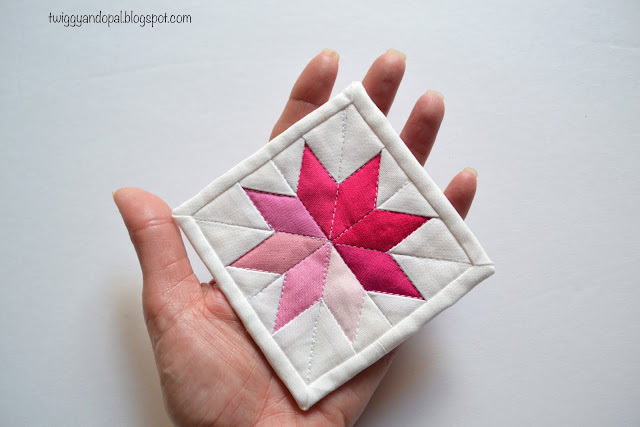 I love tiny quilts! Once I made my first one I got carried away and made at least a dozen of them one after the other. Now I mostly make them just a couple at a time, every now and then, but you never know when the next binge might happen! I agree that it's fun to quilt the heck out of them. I know what you mean about getting carried away! When I first started making them I was obsessed and couldn’t stop. Now it happens when the mood strikes me…and you never know when it’ll happen! Well done!! I think any mini under 5 inches needs a whole new name...microscopic mini. Or maybe insanity mini. LOL You always amaze me with your tiny piecing. What do you do with all these minis? You must have quite the collection. I love looking and msking! 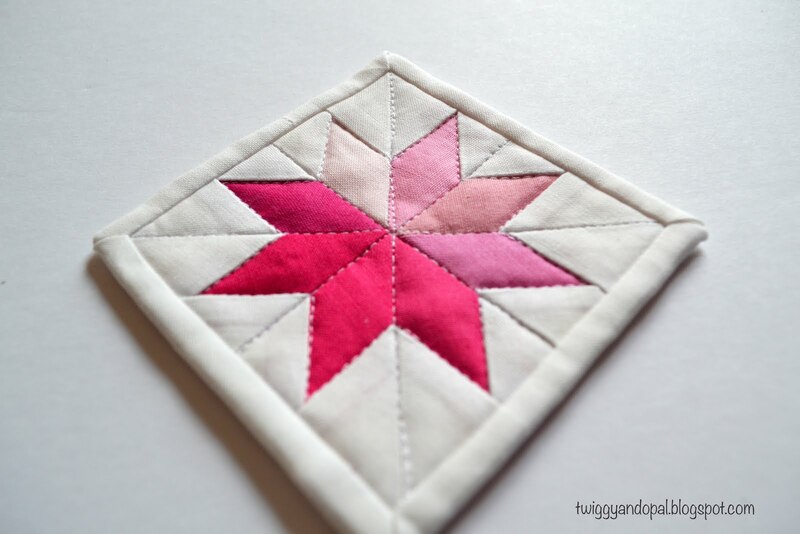 I actually love the pink star, but the flying geese is my fave!! Those are wonderful, Jayne! I'm also drawn to the rainbow star - is the paper-piecing pattern available somewhere? I absolutely LOVE making small!! I'm curious about your binding method. I don't see any join. What's your secret? 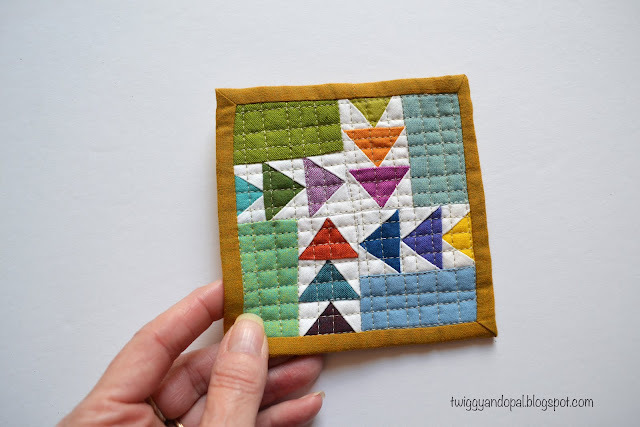 There is a certain thrill about making a mini mini quilt! There is a seam where the binding was joined, you just can’t see it! I used 1 1/4” for the binding and sew it on using the regular method except it isn’t folded. After it’s sewn on, I carefully fold the binding under and press. I’m not sure if that makes sense, but it works perfectly! Love those mini minis! I have a few of them, here and there. I think you should make a mini mini garland to hang in your sewing room. Fun bursts of eye candy each time you look at it! Those mini are so cute. I love to make them too. These are wonderful! Who could pick a favorite - Not me! I love your mini minis! especially the flying geese. I haven't made any in ages.... I need to change that! Those minis are spectacular! So precise, on such a small scale! Very fun minis! They look like a lot of fun to play with and you get pretty much instant gratification when they are finished. Super, major, wowzer on those little minis. They are so cute! These are so pretty!! 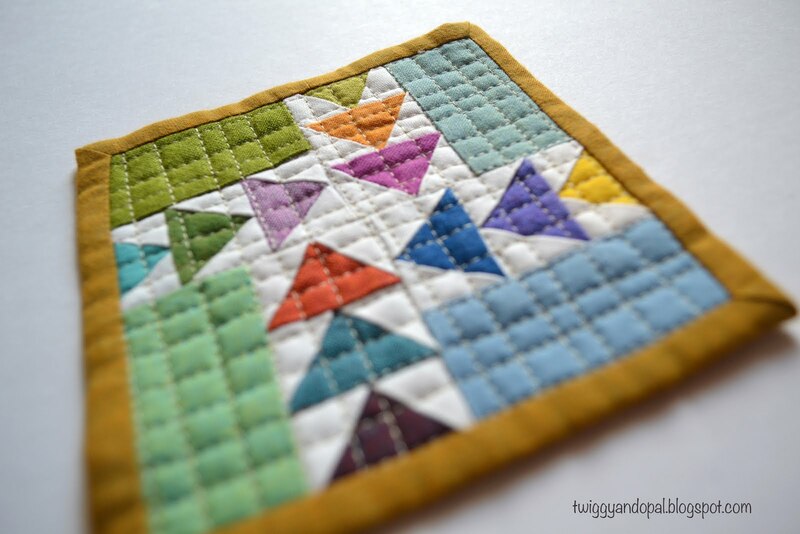 The grid quilting looks marvellous on that little one. I always love your minis! These stars are very cute.